It took a few days, but the Post found someone to go along with its bike-scare nonsense, according to the Post. SHELL GAME: A DOT agent swoops in to adjust bike-share docks in response to public input. “The bike racks present challenges to firefighters and frankly, trying to get around the city now is harder than ever before,” Uniformed Firefighters Association President Steve Cassidy said at a press conference in Manhattan. Cassidy cites no examples of firefighters impeded by bike-share stations. Nor does he explain how bike racks placed along curbs make the city more difficult to negotiate than at any time in the 148-year history of the New York City Fire Department. Once the tabloid had react quotes from Cassidy, the Post finally excerpted a statement from FDNY Commissioner Sal Cassano, who on Tuesday said bike-share stations are not a problem for firefighters and other first responders. In a story that ran Tuesday, the Post failed to verify with FDNY that it took EMTs over an hour to get a man past an empty bike-share station and into an ambulance, which FDNY told Streetsblog was not true. Yesterday, the Post repeated this account — fed to the paper by people who are suing the city to have a bike-share station moved — and again omitted Cassano’s statement. In January, Cassano and Mayor Bloomberg announced that FDNY achieved its fastest-ever average EMS response time last year. Cassidy claimed yesterday that the city’s response time numbers are off, but the union’s beef concerns 911 staffing levels, not time spent in traffic or getting around bike or pedestrian infrastructure. The Advance, CBS, and the Daily News covered Cassidy’s press conference, and none of them reported his bike-share remarks. Yet the Post would have readers believe Cassidy summoned the media to denounce bike share. And yesterday, city workers continued hastily moving Citi Bike racks from problem spots to more practical locations ahead of the program’s Monday launch. “I just don’t get why the city is being so heavy-handed with this,” said Chelsea resident Russell Orenstein, 54. 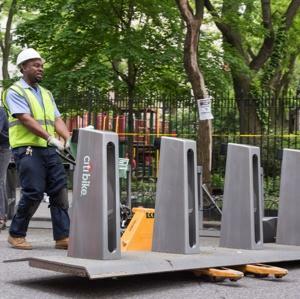 Orenstein watched yesterday as workers switched a 31-bike dock from the north side of West 22nd Street near 10th Avenue — where it was blocking the curbs in front of seven residential buildings — to the south side, where it now sits in front of Clement Clarke Moore park. He maintained that an “uproar in the neighborhood” sparked the move. So is DOT responding to input by rearranging bike stations — which are designed to be moved around as circumstances require — or is DOT being heavy handed? According to the Post, yes. Also today, DNAinfo reports that 9th Precinct traffic safety sergeant Amber Cafaro is concerned about bike-share crashes. Cafaro listed recent accidents in the East Village involving distracted cyclists talking on phones and running red lights, along with one biker who slipped on a wet roadway and wound up putting his hand through a car windshield. The East Village recently saw a spike in reported bicycle crashes, with eight in the 28-day period ending May 19, compared to just four in the same period the previous year, Cafaro said. And a month earlier, there were six bike accidents in the 9th Precinct compared to four the previous year, Cafaro said. “We are seeing a spike, and we don’t want to see a spike,” she said. If NYPD is truly worried about street users getting into traffic crashes, motorists were involved in 198,361 of them last year. And how many recent East Village “bike crashes” were, in actuality, a cyclist hit by a motorist? Cafaro doesn’t say, and it seems reporter Serena Solomon didn’t ask. Nor did DNAinfo check up on traffic enforcement in the 9th Precinct, where officers issued all of 11 speeding tickets in 2012. Cafaro also says cyclists “have to stay in the bike lane.” This is not true. But NYPD traffic supervisors apparently don’t have to be versed in NYC traffic law, just as daily reporters and editors hot to gin up conflict can’t be bothered to fact check. The New York Post loathes unions, except when one of them is willing to take an ill-informed potshot at bike share. These are the same people who publicly accused a completely innocent high school kid of being a murderer and terrorist last month because some people on reddit thought it looked a little brownish. Even when proven wrong and the kid got death threats, they refused to apologize. By Post standards, hysterical claims about bike racks lacking any truth or merit is small potatoes. Trying to shame them on easily disprovable lies is a pointless exercise. 9th Precinct traffic safety sergeant Amber Cafaro is also wrong when she says “you have to stay off the phone” when cycling. Motor vehicle drivers can not be on a phone (talking, texting, web, hands free, etc) when their vehicle is in motion. This law only applies to motor vehicles, not to all vehicles, thus it does not apply to bicyclists. Probably for safety and common sense cyclists should avoid phone use while riding, but there is no law against it and Amber Cafaro should not be acting as if there is. Driving while drunk is another law that applies only to motor vehicles and not to all vehicles, and thus does not apply to cyclists. I have heard NYPD officers make wrong statements about that law too. Some laws apply to all vehicles and thus include cyclists. But some apply only to motor vehicles. It would be lovely if the NYPD staff were interested in learning the laws they are supposed to enforce…. For that matter it would be lovely if they took an interest in enforcing the laws and used common sense to enforce the laws against those posing the greatest threat to the public. But instead of trying to protect the public, they write summonses for the offenses that are easiest for them. Bike infrastructure is great for emergency responders. Protected bike lanes double as ambulance lanes. Citibike racks are easier to get through than a row of parked cars. Also, re: “…one biker who slipped on a wet roadway and wound up putting his hand through a car windshield…” Is the Post sick enough that they included that to remind their readers of the hazards that cyclists present to their property? Hear you, but following that line of reasoning everyone should have ignored Post scumbaggery after the Boston attack. I’m pretty sure driving while impaired applies to bicycles. When Joe Average does a Google search to find out if bike share stations block FDNY access to buildings, I’m glad Streetsblog takedowns like this come up in the search results. Nope. Only Motor Vehicles: http://ypdcrime.com/vt/section1192.htm. Except for 1192.12 (related to injuries of children occupants), every instance of the word “vehicle” in Section 1192 is preceded by “motor”. Oh, I don’t have a problem with your article. I just wont be holding my breath waiting for fair or accurate coverage of anything from the Post anytime soon. In an ideal world, everyone would just ignore them for being the liars they are. § 1231. Traffic laws apply to persons riding bicycles or skating or gliding on in-line skates. Every person riding a bicycle or skating or gliding on in-line skates upon a roadway shall be granted all of the rights and shall be subject to all of the duties applicable to the driver of a vehicle by this title, except as to special regulations in this article and except as to those provisions of this title which by their nature can have no application. Now I’m not really sure. Can anyone with a legal background chime in? The best way is to think of the NY Post the same as the National Enquirer. Great for entertainment, but of little value for anything else (except maybe to line your cat’s litter box). Thank you for linking to that article! I was thinking of it when I read these posts. As far as I know, it’s not illegal to ride while intoxicated, even if it’s a really bad idea. That said, I’d much rather someone who had a few too many bikes home instead of drives. If they screw up, chances are good they’ll be the only ones hurt or dead. What is most annoying is when the Post tries to take credit for changes to Bike Share locations. You would allow a pet to defecate on the Post? I’m pretty sure that constitutes cruelty to animals. Even if it’s not, I bet the Post would report that I say it is without any fact checking. So you think it is OK to be on the phone and texting while biking, and also drunk? These are yet more reasons why New York pedestrians will be at risk from the CitiBike program. Add these infractions to bikers not stopping, going thru red lights, stop signs, coming from out of nowhere, etc. Just awful! it really is the worst thing to ever happen. If you actually read the laws about riding bikes in NYC you do have to use the bike lane if it is available. Part (ii) allows you to leave the bike lane for any of the conditions mentioned, as well as any other conditions (i.e. the including but not limited to clause). The intention of the law was to keep motor vehicles out of the bike lane, not to force cyclists to always use it. If a cyclist deems the lane hazardous for any reason, they do not have to use it. And part (ii) is basically 99% of the time. It is unsafe to be relegated to the side of the road for visibility reasons, car doors opening, potholes and debris. Good luck finding a street that doesn’t have one (if not all) of those issues! Yah except when it’s unsafe to do so. Except when (ii) When reasonably necessary to avoid conditions (including but not limited to, fixed or moving objects, motor vehicles, bicycles, pedestrians, pushcarts, animals, surface hazards) that make it unsafe to continue within such bicycle path or lane. That, for me, includes all bike lanes in the door zone. I’ll use the door zone bikelane, but if I feel unsafe, I take the lane. Can the Times Name a Transpo Project Planned More Openly Than Bike-share?